MARCH 2011 — Armed with a grant from the Centers for Disease Control, the Pulmonary Hypertension Association (PHA) chose to partner with an experienced brochure design firm to bring to life two brochure series, one aimed at patients and one aimed at health care providers. The PHA team’s intention was for fairly wide distribution of these 12 brochures. MillerCox worked with the PHA team lead to figure out how best to allocate their budget among printing, mailing, and design. Key issues included how the brochures would be reproduced and distributed, how long the shelf life should be, and what tone was appropriate for each series in order to deliver the message effectively and connect with the reader. Back at the studio, the MillerCox team reviewed the near-final text and brainstormed brochure design layouts. PHA wanted to be able to print the brochures on an office printer and mail them in a standard business envelope. This goal proved unworkable based on the amount of text, and we learned that editing was not an option. MillerCox kept asking questions, and we learned that the brochures would probably be handed out as singles, or mailed in batches. In no case would a single brochure need to be inserted into a standard business envelope. 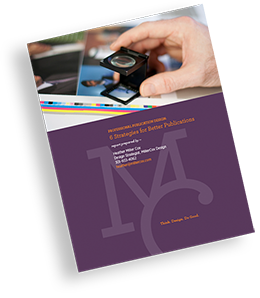 We recommended an 8-page booklet format that would pace the information comfortably and attractively, allow some room for imagery, and be easy to print from a home or office printer if pre-printed copies were not available. AT this point, MillerCox was able to develop a simple, comprehensive written agreement outlining design fees, deliverables and deadlines, working backward from the final deadline of early April. The next few days included a lot of creative brainstorming, research, and exploring as we completed a creative brief describing the primary message of the brochure series, the audiences, design, budget, and deadline parameters. Our goal was a design that would tie all of the brochures together, yet still allow each brochure to stand alone. With ample time for design, some really interesting ideas emerge, so MillerCox always requests a couple of weeks (if possible) in the production schedule to let design concepts percolate. Once the creative brief was approved, MillerCox created two design directions and presented them as PDF documents via email. PHA selected one of the designs, and after some minor tweaking, production was underway. The design was applied to all 12 brochures, with layouts delivered by email. Each was printed out at PHA, changes were marked, and the corrected PDF printouts were scanned back to MillerCox. After a few rounds of minor edits, we finalized the files to ensure they would run well on press and sent them to the printer. Meanwhile, MillerCox requested competitive printing bids from our trusted printers, as well as three printers that our client recommended. We sent sample “dummy brochures” on the paper we had chosen so that the client could feel the weight and texture and so to eliminate surprises. MillerCox selected the printer that offered the best value, and supervised printing of 12,000 copies of each of six brochures. The other six brochures were provided as web-friendly PDFs. We also provided PHA with a web-friendly and print-friendly PDF of each printed brochure for in-office printing and downloading from the PHA website. The printed brochures were delivered on time and the client thought they set the right tone and looked terrific.